Khulna is the third largest city in Bangladesh. It is situated on the banks of the Bhairab and Rupsha rivers. It is also the centre point of the Khulna division. Khulna is also known for its port. This division consisted of ten districts and it is the gateway to the world largest mangrove forest, the Sundarbans. Mangla is home to an important port for Southwest Bangladesh. It has fabulous natural beauty, but the lifestyle is not so easy here: drought, cyclone and other weather events are a regular phenomenon here. With each day, the risks increase. The local people have to fight for water on a regular basis. Khulna is also in a dangerous point because of climate change. Experts think that the future will be worse than the present. Phultola is a village in Batiaghata Upazilla near Pashur river. Most of the population is educated. Some people are living in other cities because of their studies and employment, and some are living abroad. People are mainly involved with agriculture. They are producing seasonal fruits and crops including paddy, daal, several vegetables etc. Most of the houses are made of wood and leaves. Some people are engaged with prawn cultivation. Drought and cyclone are the main natural disasters here. Because of the saltiness in the soil, agriculture is becoming increasingly difficult. Saral ward of Paikgacha Upazilla is situated just in the middle of the Upazilla. Most of the people are permanent residents here. They are mainly engaged with business, though some people are involved with prawn cultivation. The devastating form of nature can be seen from Amurkata , a village of Soladana Union of Paikgacha. It is situated near the river, Shibsha. The village has poor communication systems. Van, motorcycle and various local vehicles are the main medium for transport. For 2 pots of water village women have to go three or four kilometres away from the village. They don’t have proper drinking water or water for daily use. Most of the people work outside of the village. Most of them go to Gopalganj or Khulna district for a job. During cultivation, men and women work together in the field. Amurkata has huge lakes for prawns. Those who have smaller fields cultivate prawns and crabs. Because of saltiness in the water, they do not have any other option for cultivation. Houses are made of several leaves and soil. 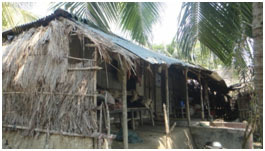 Because of the cyclones, there is a school which can be used as a cyclone centre as well. Our second place was Jessore beside Kapataksha river which is related with poet Michael Madhushudan Dutta. Jessore is one of the districts of Khulna. Jessore is also one of the oldest cities. It has eight Upazillas. During the British Raj period, Jessore was a “mahakuma”. Kotoali, Bagharpara , Keshobpur and Manirampur were our workplaces. Bahadurpur of Kotoali Upazila had less risks. Sekandardarpur of Bagharpara and Panjia of Keshobpur are less affected by natural disasters. Only Diganga of Manirampur has the risk of flood, but it is not because of nature, but because of drainage problem. 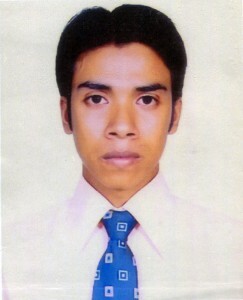 After observation on four Upazillas of Jessore we found that people are mainly involved with agriculture. But they work in their own fields with different vegetables, paddy, mustard, daal and wheat. They produce fruit for a commercial purpose. To have good lifestyle, people work in the capital city, their own divisional city or abroad. For higher education many people live in cities.